Do your summer plans include going to the beach, but you’re wondering how you’ll keep the sand out of your cast or orthopedic walking boot? CastCoverz! has some solutions for you! CastCoverz! offers FUNctional products for comfort and care while casted, bandaged, braced, in a boot, or on crutches. 1. AquaShieldUSA – lets you enjoy swimming at the pool, beach, or lake without the fear of getting your cast wet AND keeps the sand out (available for both arms and legs.) 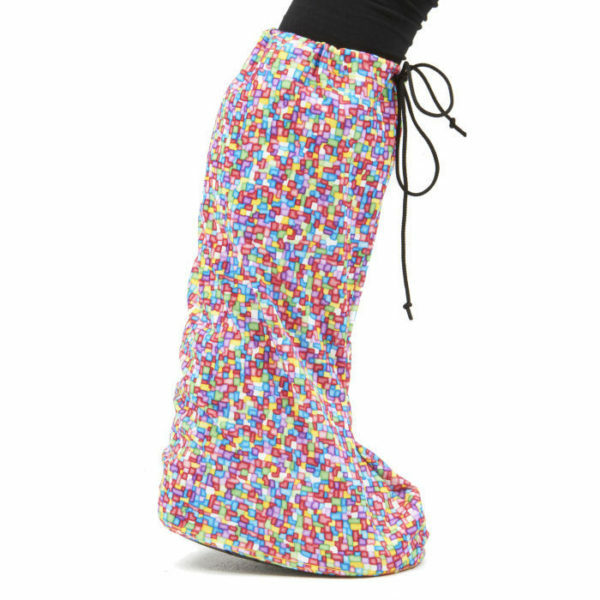 SAFETY ALERT: NOT TO BE USED FOR IMMERSION WITH AN ORTHOPEDIC BOOT!! 2. Slickerz! – For your leg cast or bandages, cover it with a CastCoverz! innovation, Slickerz! Slickerz! 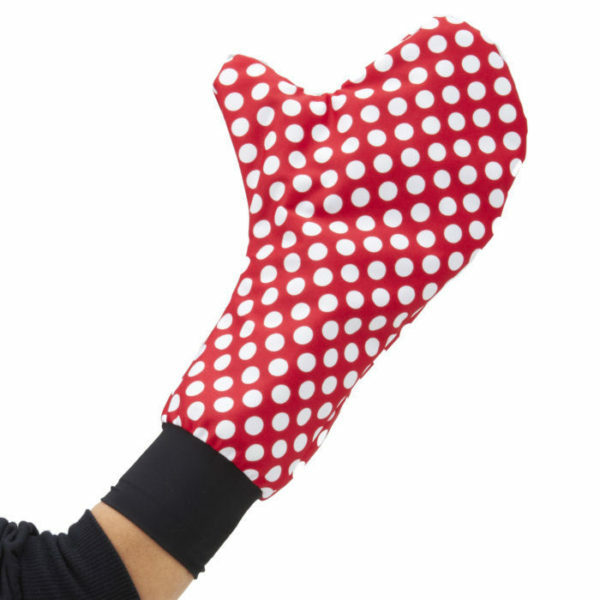 is a protective cover made in-the-USA of a poly-urethane fabric which keeps 97% of the sand granules out. 3. BootGuardz! – Protect your orthopedic walking boot, boot liner, and toes from sand getting inside with BootGuardz!, our made-in-the-USA/weather resistant boot cover. For proper footing and your safety, the tread is left exposed. Not for immersion in water. 4. Glad® Press‘n Seal® – Press’n Seal seals tight on a variety of surfaces, including skin! Just wrap Press’n Seal around a cast (make sure to overlap so 1″ or 2″ of your skin provides the seal). It will keep you dry for light water activities (splash and plays, sprinklers, etc…) and will keep sand out, too! 5. Mittz! Dry keeps sand out of hand casts, braces and splints with Mittz! Dry, our made-in-the-USA impervious to sand and dirt cover. Because it is a seamed product, it is not for immersion in water. CastCoverz! 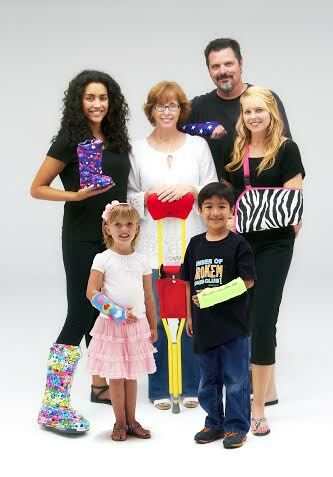 provides fun, function-able, and fashionable covers for casts, braces, splints, boots, slings, crutches and so much more! These covers will help keep your cast clean and snag-free from items such as your clothing, furniture, and other people! CastCoverz! fabric cast covers are for daily wear (not for sand or water because fabric is a weaved product allowing sand granules/water to seep in). Don’t let being in a cast or walking boot spoil your summer vacation plans! If you have any questions about our tips or our products, please do not hesitate calling us at 1-800-CASTCOVER (1-800-227-8268). Go ahead and enjoy the beach! CastCoverz! 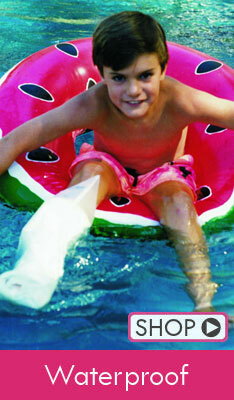 creates fun and functional fashions for casts, braces, splints and boots. Our products, our service and our blog helps people feel better so they heal better. We'd love your comments, cast cover stories, broken bones stories and tips! If the boot guard doesn’t cover the entire boot and leaves the bottom tread exposed how do you truly keep the sand out on the beach? Especially, the powdery sand in Destin, Florida? Seems like it won’t work to me unless you put it in a plastic bag first and negates the purpose. Hi, Liz! Bottom line, you are absolutely correct! But, we can provide context. We have 4 products that cover orthopedic walking boots. All with the exception of 1, leave the tread exposed for the safety of the wearer. NOTHING should be between the sole of your boot and the ground. You’re already compromised, injured, favoring it, wearing an orthopedic device, etc… all which leaves you vulnerable to more injury. Not to mention walking on fabric would shred it in about 1 block. 🙂 Our products are engineered to stretch around the edge of the boot and depending on the product have additional “fasteners” to further anchor it to your boot. Now, all that being said, not all beaches are soft packed. When we talk to our customers on the phone (we’re one of the last companies standing that still LOVE to talk to customers on the phone! ), we ask our beach-going customers (not all are) if they know if the sand is soft or hard packed. Then we explain that soft sand, just like wearing sandals, will “push up” on the side of your boot, and “may” push some sand up into the boot. Most of our soft sand customers take the risk. Less than 1% of our BootGuardz! are returned for that reason. BootGuardz! is VERY effective for rain [NOT puddle jumping 🙂 ], light snow, even some work or medical locations (think poultry processing plants, hospitals, clinics, labs,…) that require a wipe on – wipe off fabric and toe coverage. So, in closing, regardless of whether you purchase one of our products or not, NEVER, PLEASE DON’T, put a bag over your boot FOR YOUR SAFETY!!!!! PLEASE!!! All of us at CCZ!